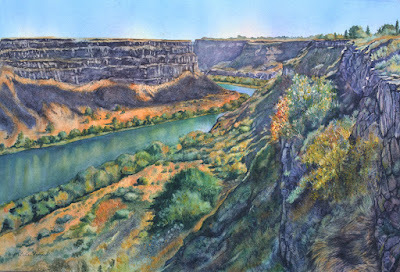 Now that I live in Southern Idaho, I am able to take advantage of painting the beautiful Snake River Canyon. 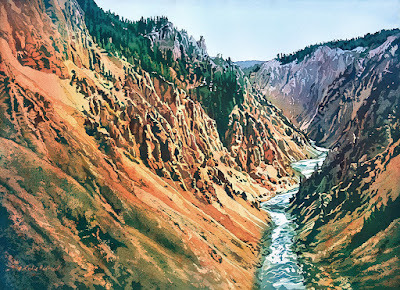 This image is of the canyon as seen from Twin Falls and is the same canyon that Evel Knievel attempted to cross in a steam powered rocket in 1974. 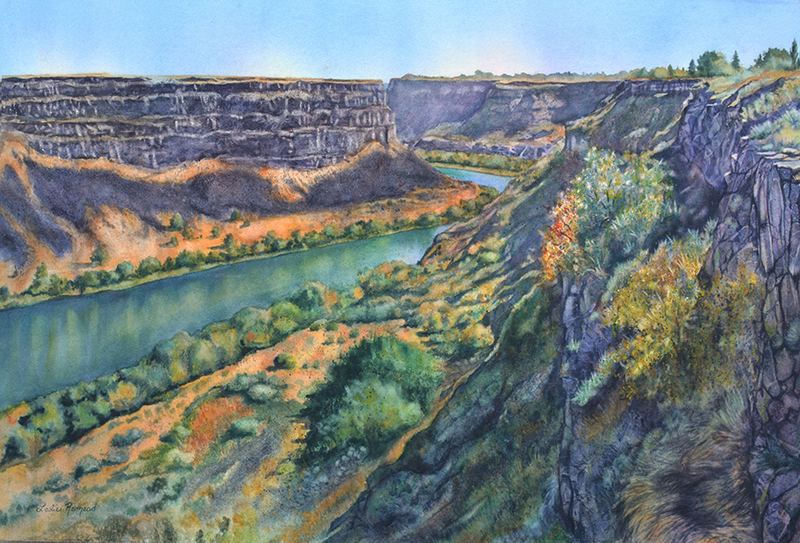 The painting is now on exhibit at the Twin Falls Center for the Arts until July 6. Last week I got a call from the Idaho Watercolor Society informing me that I had won a big award at their 38th Annual Exhibition that was showing at Boise State University. This person also said that I needed to be at the awards ceremony to accept my award. I had not planned on attending the opening reception since BSU was over 2 hours away and being new to Idaho, I didn't really know anybody or have anybody to go with. So I had originally decided not to go. However, when I informed my family that I won an award, both my son and mother expressed an interest in attending the reception and ceremony with me. I was happy that they were there to support me. We did joke that I probably only got honorable mention or an award was given to all the participants and everyone was informed that they won an award and needed to be there just so they would fill the room. After seeing all of the 50 watercolors in the show, I began to wonder how true our statement about the awards really was. It is a well done show and each piece is beautifully done. Watercolorist Judi Betts was the juror and she must have had a hard time deciding the awards. So at the awards ceremony, there were 20 awards given out, starting with 20 and counting down to the first place winner. I thought for sure I would be somewhere closer to 20 but Judi kept counting down and my name wasn't being called out. I was very surprised when she announced the second place winner as me! I almost did a happy dance as I skipped across the stage to not only receive my award (it is a beautiful clear plaque that I'm holding in my hand) but to meet and have my photo taken with Judi Betts. Thank you to Judi for not only choosing my painting to be in this wonderful exhibition but for giving it such a wonderful award. It is titled Beauty As Well As Bread and is of Yellowstone National Park.
" Everybody needs beauty as well as bread, places to play in and pray in, where nature may heal and give strength to body and soul." Since I find Yellowstone and painting to be my healing places, I thought that this quote expressed how I felt about both. The show will be up at the Boise State Student Union Gallery through the month of June. Then it will be part of the 20 pieces selected for traveling show that will be shown at various places throughout the state until December.